Your kids will have a blast making these Super Easy Kumihimo Bracelets. 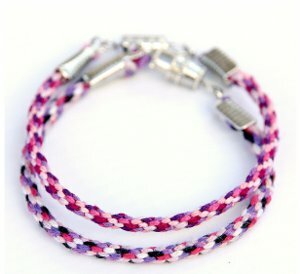 Using the very popular kumihimo braiding technique, these DIY friendship bracelets create a cool and colorful accessory. 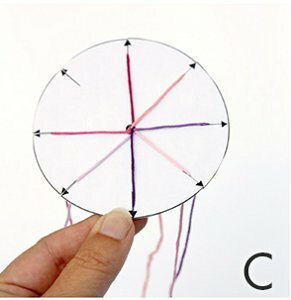 This is an easy kids crafts that's super budget-friendly. 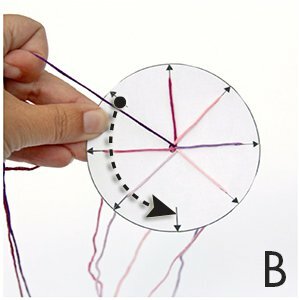 Creating the template from a cardboard box using some embroidery floss. This is the perfect creative activity for a plane ride or long road trip. This DIY friendship bracelet will keep your kids occupied and help them create colorful designs that they can wear or share with their friends. 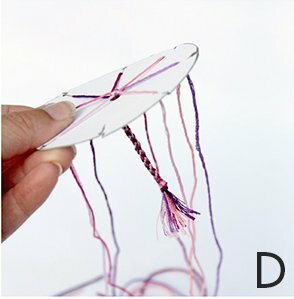 These stunning free bracelet patterns are made by weaving strands of embroidery floss together to make a stunning design that will shine on anyone’s wrist. Whether you are looking for a boredom-buster on a rainy afternoon or need a great summer camp activity, kumihimo bracelets are a time-honored summer tradition that you are going to love. simple and just tie the two ends of your bracelet together). If you like this DIY friendship bracelet, you'll love these 20 Bracelet Patterns: Macrame Bracelets, Friendship Bracelets, Hemp Bracelets, and More. There are so many creative ideas in this free eBook, you might not know which project to work on first. 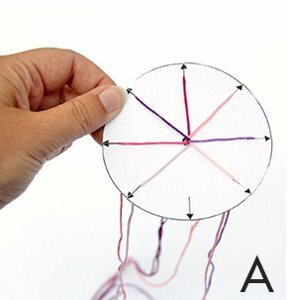 If you've never tried a certain technique for free jewelry patterns, now is the time to test your skills. So this is how they make these bracelets. It's super easy once you print the card. I wish you could use thicker yarn to make the bracelets. This is so fun though. I have never heard of these before but you can bet I will be M aking a few of them. My grand daughter would love making them with me. She is 8 and really getting into DIY crafts. I think I got her hooked.the first thing she says when she gets here is, grandma gave you found something to make at that place on your computer? I love this Super Easy Kumihimo Bracelets pattern. I need to find a printer to make this one, Unless someone knows just how big the template is? I see that suzu2 below posted to enlarge the template to fit a full sheet of paper, but that doesn't help if you don't have a printer. With that being said, this would be a great idea for my Grand children when they come visit and it's too cold out or raining. They love doing crafts and this would be great.. I saved it here and hope to use it soon. Thank you so much for this free how to..
Can you tell me what the size of the template should be? The printout shows 6 tiny templates. Thank you! I enlarged it so the six small templates fit one full sized sheet of paper. It would be nice if there was a way to download the pattern instead of just saving it in favecraft. I would rather have it in my pdf file than have to go online just to use the pattern. I am actually making a charm bracelet for a coworker right now and have been searching for an easy, yet interesting way to work the string I'm using. I didn't want to go with a plain old braid, wanted something new and interesting. I love that you can customize this with whatever colors you like. Were there any difficulties making this bracelet, or was it pretty straight forward? I know you posted this a long time ago but incase anyone else has the same question, you can print it out. Look up at the left hand corner of the page where the first finished picture is shown. There are button so I really average, notes and print. Just print it out and you are all set. I hope this helps someone else too.